The 2018 St. Paul Regional Piping Solos have been completed, and the results are posted. The top 3 contestants in each grade are eligible to compete in the Terry McHugh Memorial Solo Piping Contest, taking place on April 21, 2018 in Park Ridge, IL, and have already been enrolled. "The Louisville Scottish Rite Consistory is glad to host the MWPBA Kentucky Solo Qualifier. The contest will take place in the main auditorium, which seats approximately 385 people, and a stage which can comfortably seat an 80-piece orchestra. This is the first year for hosting the event in Louisville. Due to the outstanding competitor response, it will likely remain in Louisville. Photos and video recording are allowed. The doors are to be opened by 8:30 a.m. The 2018 Alma Regional Piping Solos have been completed, and the results are posted. Experience a rare and unforgettable journey through Celtic music guided by world-renowned piper and entertainer Fred Morrison. 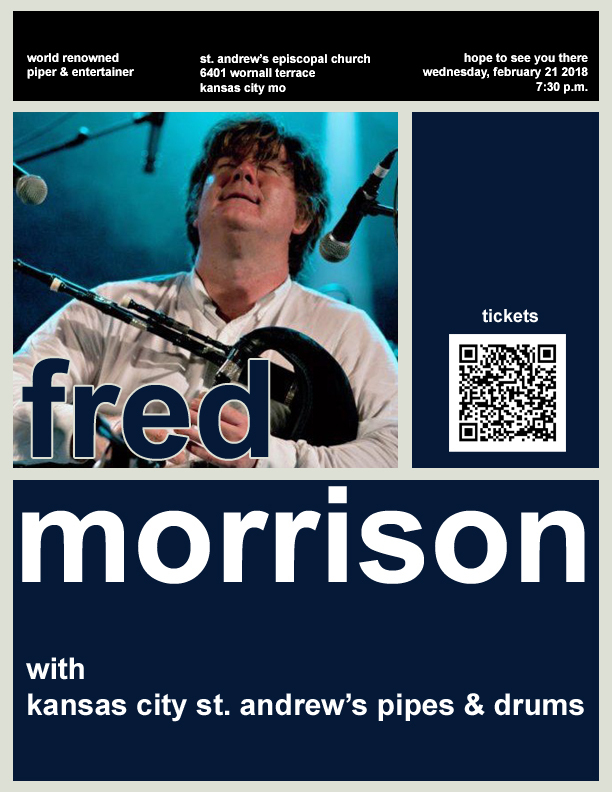 Fred will be appearing for one night only – Wednesday, February 21 – at St. Andrew's Episcopal Church, 6401 Wornall Terrace, in Kansas City, MO. The performance will begin at 7:30 p.m.
A native of western Scotland, Fred’s broad repertoire is rooted in the music of his father's native South Uist in the Outer Hebrides and includes traditional music from Brittany and northwest Spain. His first love remains the Great Highland Bagpipe, but his incomparable mastery has grown to include whistles, Scottish smallpipes, reelpipes and Uilleann pipes. Fred will be joined by members of Kansas City's own award-winning St. Andrew Pipes & Drums for an unforgettable evening of music. The Chicago area piping community has lost one of their own. On January 29, Don Larson, Pipe Major of the Chicago Highlanders, passed away leaving behind a wife and two daughters. Don was a long time member of the Chicago Highlanders; a former Pipe Sergeant, and most recently, Pipe Major. 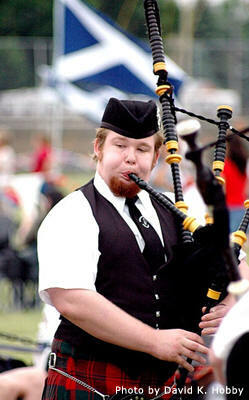 Don is also a former member of the Shannon Rovers Irish Pipe Band. A visition and service for Don is scheduled for February 10 at St. John United Church of Christ in Arlington Heights. Visitation hours will be from 10 a.m. - 12 p.m, the service will begin at noon. Friends and former band-mates of Don are invited to join the Highlanders in a massed-bands style "Amazing Grace" tribute during the service.